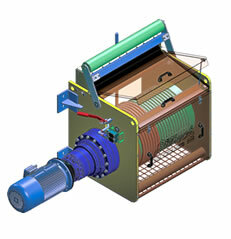 The conveyor take-up winch will act on the associated take-up pulley trolley via a sheaved cable system with a 4:1 reeving ratio. 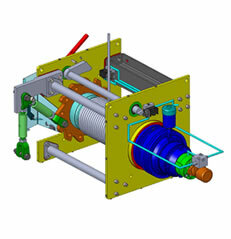 A load cell connects the wire socket to the lug on the take up winch base frame. The load cell is wired to a load cell monitor, which provides an output signal of the belt tensions for display on the LCS and processing by the PLC. The LCS display unit also displays high tension and low tension set point outputs. The PLC will process the input signals from the LCS (digital inputs and analogue tension value) and determine when to start and stop the variable speed drive. The PLC will also signal to the LCS the status of the system (digital outputs). 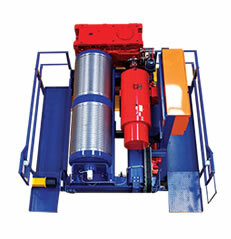 Dynamic braking resistors with continuous rating are provided for conditions where the take up winch is winding out rope to reduce the belt tension. A Local Control Station (LCS) is located adjacent to the take-up winch base frame. It contains all of the terminals for connection of all winch control and signal components as well as the load cell transducer. 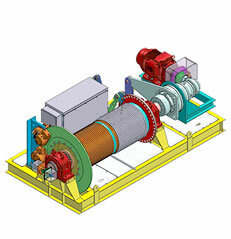 When increasing tension in the system, the VVVF drive will ramp up frequency. When the frequency exceeds the Brake Release Frequency the brake will release. 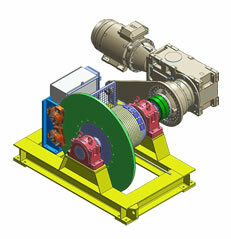 The drive will operate at full speed until, run at full speed until the tensions set point is approached. The VVVF will ramp down the frequency, applying the brake when the frequency reaches a specified limit and stop. When decreasing tension in the system, the VVVF will increase frequency, releasing the brake when the Brake Release Frequency is reached. When full speed is reached the VVVF drive run at full speed until the tension set point is approached. Then reduce frequency until the Brake Release Frequency is reached then apply the brake and stop. 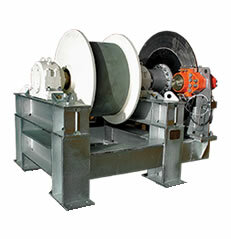 During normal operation, when the winch is modulating around the Tension Set Point, the winch may not reach full speed before required to stop. 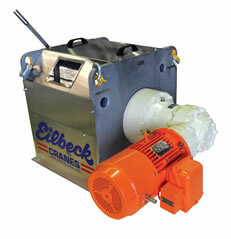 The variable speed drive is equipped with a dynamic braking resistor. During tension decrease phase (winch reverse direction) energy is dissipated from the motor by a dynamic braking resistor. Assistance from the VVVF supplier may be required to determine the Brake Release Frequency. 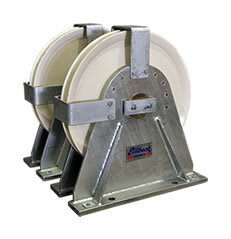 Winch over load protection A winch overload alarm is derived by monitoring the VVVF “motor torque” parameter. This should be set to 150% of motor FLT. The PLC will determine if an alarm condition is present, and signal to the VSD to STOP, as well as preventing forward direction (increase tension) from occurring. Local Control Station, PLC’s, Winch over load protection and Variable Voltage Variable Frequency Drive are supplied by others.